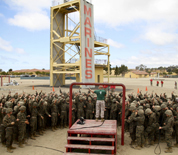 Marine Corps Recruit Depot San Diego is located in San Diego, California. It is the site of Marine Corps Recruit Training for men who have been recruited west of the Mississippi River. The mission on base is to perform the initial training of enlisted male recruits. The base is also home to the Drill Instructor's School for the Western Recruiting Region and Recruiter's School. Due to it's Spanish Colonial Revival style architecture, MCRD San Diego and it's original buildings are on the National Register of Historic Places. The base is the site of the MCRD San Diego Command Museum. This MCRD San Diego directory features the critical info you'll need to navigate through the many facilities and recreational opportunities available on base.